Sweden's outspoken and influential heavy metal band, ARCH ENEMY, has joined forces with the worldwide human rights organization, Amnesty International, to help raise awareness of social injustices around the world. 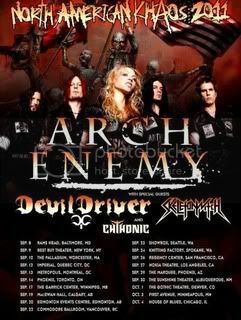 Amnesty International booths will be present at many of the upcoming dates on Arch Enemy's headlining North American tour, North American Khaos 2011, to hand out flyers and accept fans' signatures in support of the cause. Arch Enemy vocalist Angela Gossow states: "We have invited Amnesty International to join us on the North American Khaos tour to help raise awareness for defending human rights, freedom of speech and saving lives. We are living in very extreme and turbulent times and it is important to take a stand. We hope one day everybody is allowed to freely say what they think, that no government has the right to punish and kill those who do not conform and that those who are oppressing the masses will be brought to justice. It will be a long and hard struggle, but it's a goal worth fighting for. The metal scene is non-conformist, alternative and revolutionary – We know how to practice what others preach. So let's go out there and support the cause! Go to http://www.amnesty.org for more info or check out their booth at some of our shows!" The supporting bands on the tour have also joined in on the fight. CHTHONIC added, "Freedom to create is the fundamental to artist's dignity as freedom of speech is the fundamental to human rights for all human beings. We should fight for those who are denied these privileges in other parts of the world so that they will be entitled to these rights one day."